This is my friend Ole. I call him a super bicycle user. He rides his bicycle absolutely everywhere. To meetings all over greater Copenhagen. 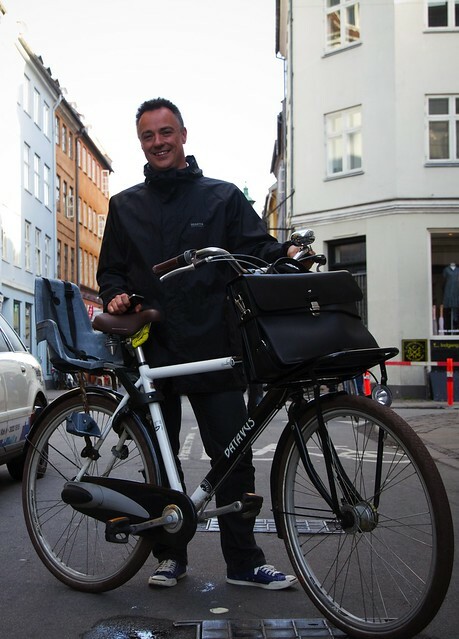 When I met him at the TEDx Copenhagen day, he humbled me when he told me that because of reading Copenhagenize.com, his family sold their Volvo and committed themselves - like true Copenhageners - to bicycles. He has a blog called 13 hjul - 13 wheels - about his family's experiences on their bicycles. Ole is my hero. And he looks damned fine on a bicycle. An interesting article about why women in the US don't bike more! do you have the link to Ole's blog ? It's not an interesting article. It's completely off the mark. But I know what you mean. My family bicycle blog mentioned is 13hjul.dk and its English language cousin site is olekassow.com.